In November 2002, I saw Benoît Mandelbrot’s presentation, “The Fractal Revolution”, in Portland Oregon. It was a short overview and introductory presentation about fractals. I’m an enthusiast, so the content was familiar. The great pleasure was seeing the man himself – Benoît Mandelbrot, the Father of Fractal Geometry – talk about how he revolutionized science, math, and our entire view of the world. Fractal dimensionality explains something truly fundamental about the forms and patterns we see daily. However, fractal dimensionality was unknown before Benoît Mandelbrot’s work, which from the late 60s on illuminated this deep truth about the geometry of the world. During Mandelbrot’s 2002 talk, it struck me how much intuition informed his discovery of fractal geometry. Mandelbrot described looking at the ‘drunkard’s walk’— a kind of ‘random walk’ equation—and “seeing” what its fractal dimension was, intuitively. Such amazing intuitive leaps are familiar in science. The formal steps of providing solid proof soon follow this “eureka” moment, during which the answer is revealed. Mandelbrot’s sudden deciphering of the ‘drunken walk’ is no different from, nor any less significant than, Einstein’s discovery of relativity, Isaac Newton’s apple-inspired understanding of gravity, and the original “eureka” moment, when Archimedes’ bodily volume displaced the water in his tub. Like those intellectual explorers before him, Mandelbrot looked at the world and saw a previously unseen truth. He built on what came before, and in so doing, revolutionized it. The Mandelbrot set, named for Benoit Mandelbrot. Image from Wikimedia. Mandelbrot intuited the world’s fractal nature. He saw the laws that apply to stock markets and clouds, population trends and eddies in a stream; the basic organizational principles of all systems. Fractals and deterministic chaos have always surrounded us, but had never before been identified. Mandelbrot’s insights revolutionized thousands of years of scientific thought. As you look at the Mandelbulb’s strange organic forms, you are looking at the legacy of Benoît Mandelbrot, one of the most influential scientific thinkers of the last hundred years. Reference: Benoît Mandelbrot “The Fractal Revolution” Nov, 2002, Portland OR. 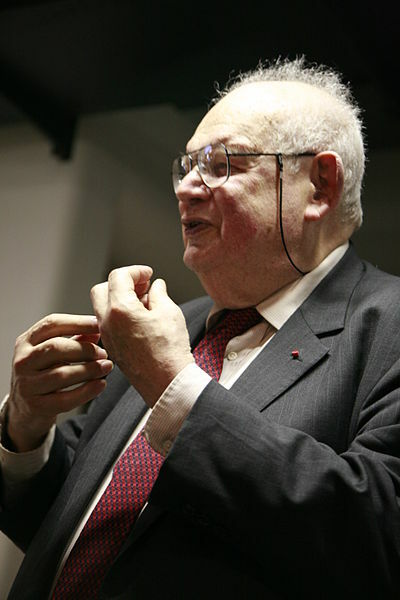 Benoît B. Mandelbrot (20 November 1924 – 14 October 2010) was a French American mathematician. Born in Poland, he moved to France with his family when he was a child. Mandelbrot spent much of his life living and working in the United States, and he acquired dual French and American citizenship. Mandelbrot worked on a wide range of mathematical problems, including mathematical physics and quantitative finance, but is best known as the popularizer of fractal geometry. He coined the term fractal and described the Mandelbrot set. Mandelbrot also wrote books and gave lectures aimed at the general public.